In the past several months, we’ve had the pleasure of traveling back to Minnesota for the weddings of two dear friends. We’ve missed all too many weddings and life events during our time out East, so we were very happy to celebrate with our friends. I was all the more pleased to wear handmade dresses to each wedding. 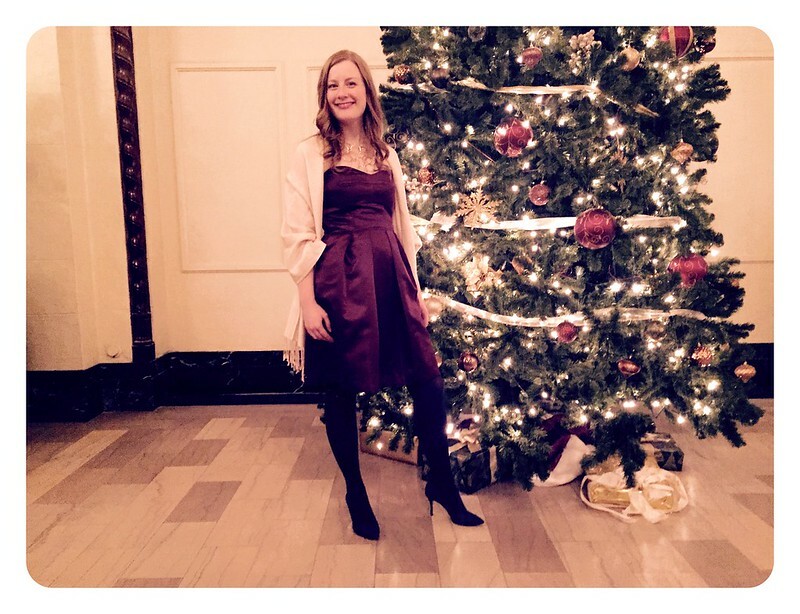 I don’t get a ton of opportunities to dress up these days, and both weddings were in the same city with the potential for overlapping guest lists, so I wore two different dresses. I haven’t blogged about either one of them, and I don’t have a ton to say about either, so I thought I’d share them both at once. Pardon the overexposed photo. 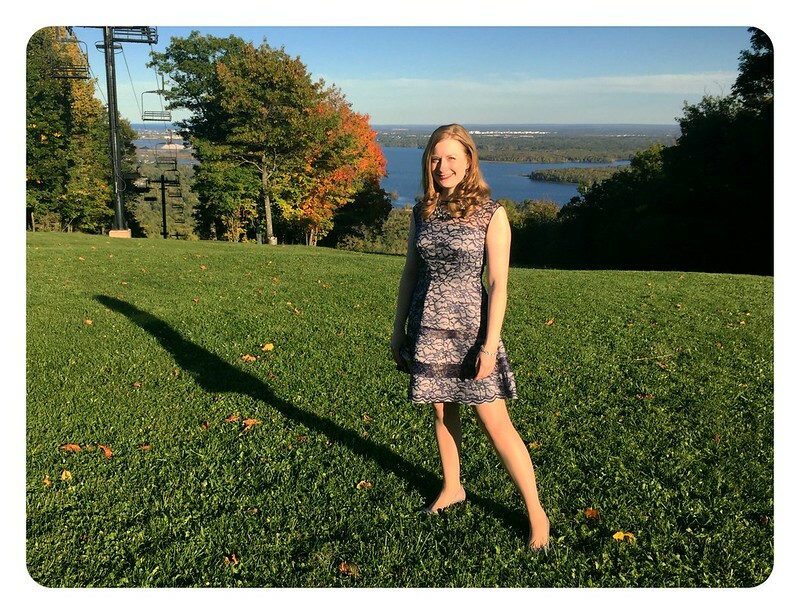 Our first wedding took place at a resort overlooking the lake on a beautiful fall day, and we had to sneak in a few photos between my husband’s groomsman duties. I wore Vogue 1393, a pattern by Kay Unger. I had intended to wear this dress to a dance event but didn’t finish it in time because it was so labor intensive–there’s a lot of basting to get that lace to stay put–so this was actually its debut. As it turns out, I’m happy I didn’t wear this dress dancing because the non-stretch lace is a little limiting in the shoulder region. This dress was the reason I finally caved and bought an invisible zipper foot for my sewing machine. I’ve used it several times since, and I think that it makes invisible zippers so much easier that it’s a good investment. There’s not a whole lot more to say about the construction of this dress except to point out those scallops on the hem, which I attached by hand because of the A-line sweep of the skirt. Tedious, but worth it. Our second wedding took place in northern Minnesota in January, so it posed quite the challenge. I ultimately decided to finish long-time UFO Vogue 1174 by Cynthia Steffe and wear it with tights and a pashmina. I wish I had more detailed shots to share, but to be honest, this dress doesn’t fit well. I started it long enough ago that I’m now cutting a larger size, and the bodice really flattens me out. Since I had already done a lot of work on the dress, it seemed a shame not to finish it, but I may not wear this one again. 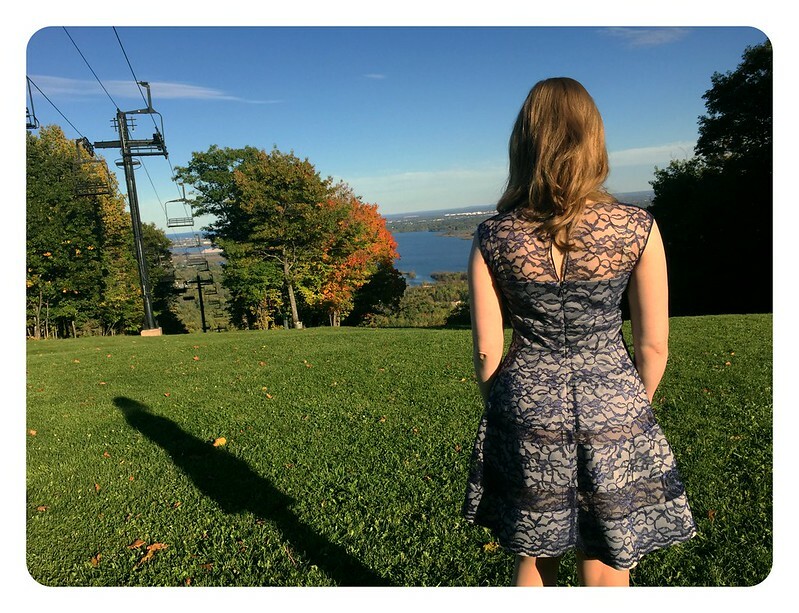 It used to be that I loved making a new dress for a special occasion, but I’ve found that I much prefer to focus my sewing time on garments that I’ll wear every day. I doubt that will keep me from the occasional fancy garment, but I’ll certainly take a second look at my existing closet before starting another cocktail dress. I’m totally with you! I used to love sewing special occasion garments. But, now. I’d rather invest my time in items I’m going to wear over and over. The lace dress is beautiful. I can see how it would be labor intensive. And, I can’t imagine trying to dress for a northern Minne wedding! You did great with both.